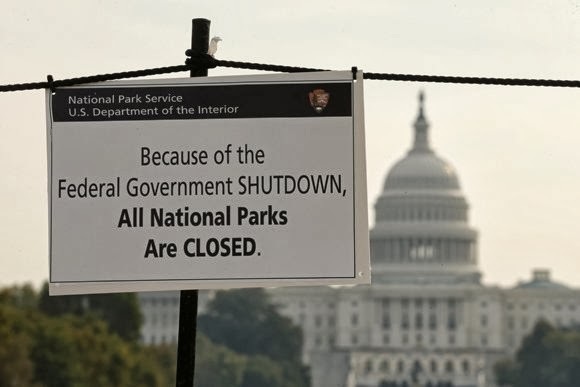 I haven't written much about the current political standoff in D.C. over the government shutdown, the debt ceiling, the possible government default and the effort to delay or impede the implementation of Obamacare. It's not that I haven't been following the situation - I have. Neither is it that the issues at stake are not tremendously important - they are. But for the most part this has been a "nothing new under the sun" non-event for me. It's the same old, same old and it isn't going to make one bit of difference from the last attempt at brinksmanship by all concerned. Democrats have been intransigent bullies with an attitude that Republicans do not merit a seat at the bargaining table. They want capitulation and nothing less. They are willing to use the media as a blunt instrument to achieve their objectives - a debt ceiling increase with no conditions or restrictions, the continued implementation of Obamacare, and believe it or not now, a rollback on the fetters of the sequester. For the past few weeks, Democrats from the president on down decried Republican tactics on a potential government shutdown as political hostage-taking on a par with "extortion." So, of course, now that the Republicans are on the run, the Democrats are doing the exact same thing in reverse. They're saying they want to undo major part of the sequester budget cuts as part of a deal to end the government shutdown and raise the debt limit. It's as though Senate majority leader Harry Reid (D) of Nevada has finally sensed his moment to destroy that product of tea party Republicanism once and for all. Does that seem that much different from 2011? No. Remember the Obama administration's "the sky is going to fall" rhetoric leading up to the shutdown? Remember how they backtracked after the sky didn't fall? It's all about what they need to say at the moment with no need to worry about a backlash in the media over any glaring inconsistencies. The GOP are not blameless here either. They are playing to stereotype as well. They talk tough and then they cave. They are willing to take a bit of heat with the general public to appear to sympathize with the Tea Party wing of the Republican party. But when it comes to a default, to a downgrade of the nation's credit rating they feel like they have to blink. No notion of what is right for the country matters at that point because they fear being relegated to a permanent minority status after they are forced to shoulder all the blame for the consequences. It's understandable, but it doesn't make it right. Even in the 2011 Mexican standoff with the president, after a trouncing of Democrats in the midterm elections of 2010, they had the sequester to fall back upon and a president who was forced to make those comments about the world not ending immediately. With the wind at their backs, they still did not go to the mat and allowed themselves to be rescued by the sequester. They don't want to lose their congressional gains and they want a shot at the presidency in 2016. They are being driven by fear. Still. That has not changed in 2 years. Unfortunately being driven by a fear of losing is not a recipe for winning - ask any professional sports team that has persevered through such an attitude and gone back to a hunger for winning. The Tea Party faithful have played to form as well - the attitude that compromise is unacceptable is not too different from the attitude of Harry Reid. Whether you are right or wrong, the attitude is not a recipe for long term success. The all or nothing, no retreat - no surrender attitude made some sense in 2011 when they had trounced the president's team in mid-term elections. There was no point in pulling back then. Pressing their advantage made sense. Despite the media's constant lambasting and mischaracterizations of the Tea Party, public sentiment fit the mood of conservatives in a lot of respects. Trying to capitalize on that was a good idea. But since then the game has changed. The media's bashing of the Tea Party has had some long term impact. The media's characterizations of the players, the Tea Party in particular, has made a difference. Their positions seem to many to be too extreme now. The no retreat, no surrender attitude doesn't work in that light. Hitler refused to let his generals retreat as WWII waned and it cost Germany militarily and denied them the chance to re-group their over-extended armies. It may have cost Hitler his last shot at winning the war. So the Tea Party, blinded by the goal, have eschewed strategic and tactical foresight to their own long term detriment. There's no easy way to achieve their objectives. Nor is there a means to strategically or tactically adjust in a way that does the Tea Party any good. But to deliberately not consider options is a blinkered approach to politics that has an absolute certainty of leading to disaster for their common cause (and their perceived public image). The media is playing to form as well. It was okay for them to start thinking about Hillary Clinton and treating this president as a lame duck when there were scandals aplenty on the front page. But with this budget battle front and center, the media have circled the wagons around their erstwhile savior and allowed him to once again play a dangerous game of brinksmanship with GOP with the country hanging in the balance. They are willing peons and have contributed to this mess. Again - this is no change from 2011 when they portrayed the GOP as mad with power and the Tea Party as cretins with no knowledge, no understanding and racist tendencies. There's nothing in the media about the ridiculousness of the positions of Harry Reid or the stubbornness of the president. The only bad they will portray is on the right. This is all the same old same old. With no safety net of a sequester it becomes a 'who will blink first' game. It won't be Harry Reid or Obama. It will be the GOP middle who will pass a bill with Democrat support in Congress that will be palatable enough for the Senate Democrats and Obama, but not of course, without some window-dressing pushback first for their liberal constituents. It's all politics as usual. The GOP will go back to their voters and say if you want this changed you have to work harder on our behalf so we win more of Congress and we win the presidency. The Democrats will do the same. The media will declare it all an Obama victory and then move on to Hillary Clinton once again with the crisis in progressive-land averted. And the Tea Party? Will those of us attuned to such positions and views be moved to be more strategic? For the most part, I think not.